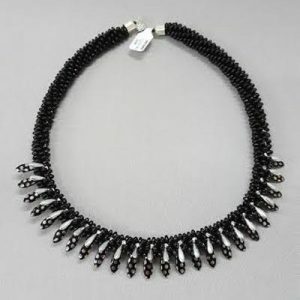 This elegant monochrome necklace is made from two styles of beaded beads using Toho glass and Swarovski crystals. The clasp is a 14K gold filled round filigree box clasp. Inquire about matching earrings. Made by Karen Kubby. 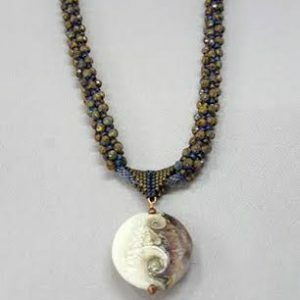 This four breasted beaded goddess is woven with glassToho beads (one at a time!) that hug Swarovski pearls. The S-hook clasp is 14K gold filled. 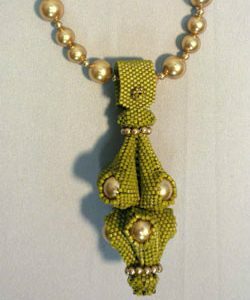 The lariat has 3mm, 8mm, and 10mm Swarovski pearls. Made by Laurel Kubby. 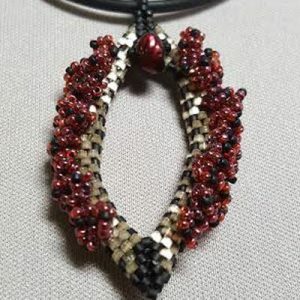 This four breasted beaded goddess is woven withToho glass beads (one at a time!) that hug Swarovski pearls. The S-hook clasp is 14K gold filled. The lariat has 8mm and 4mm Swarovski pearls. Made by Laurel Kubby. 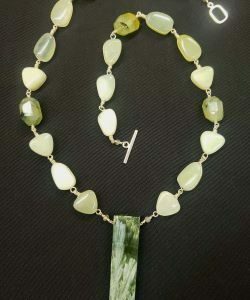 This necklace is made from channeled jade beads, faceted prehnite nuggets, a touch of moonstone, and a spectacular seraphinite pendant. It is put together with textured sterling wire. This piece is 24″ long. Item #10780. Peyote stitch and ruffles create this lovely representation of the female genitalia. Hanging from a rubber necklace, this piece will have 20% of proceeds going to the Emma Goldman Clinic. Made by Karen Kubby. Item #10018243. The 17″ kumihimo lariat made with Toho seed beads and etched Czech fire polished beads holds a Donna Troll lampwork bead with a “winge” bail. Copper findings. Made by Laurel Kubby. Item #10018349. 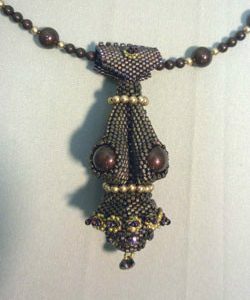 This 19″ kumihimo lariat is embellished with dagger beads in two layers. The piece is finished with silver plated findings and a magnetic clasp. Made by Laurel Kubby. Item #10018373. This 16″ kumihimo lariat made with Toho glass seed beads has lovely borosilicate drops in the middle. Finished with a sterling lobster class. Made by Laurel Kubby. Item #10018349. 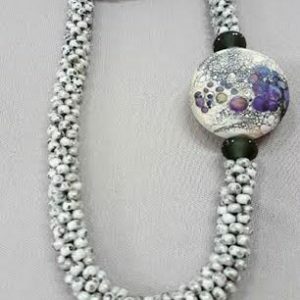 This 21″ kumihimo lariat made with Czech glass seed beads includes lampwork beads by Angelica Schott. 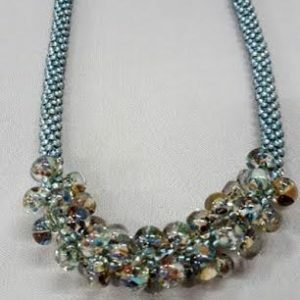 This piece does not have a clasp and the focal bead could be worn on the side or in the center. Made by Laurel Kubby. Item #10018349. This is a contemporary piece created by the Hausa people, who are the largest ethnic group in Nigeria. 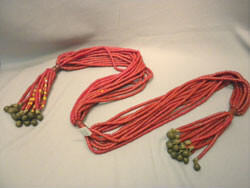 The necklace is mostly red, with flashes of yellow and many bells on the fringe at the bottom. 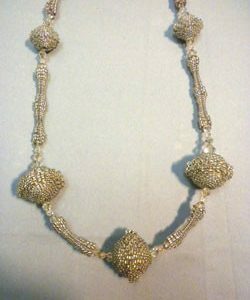 The piece is worn hanging around the neck loose or one side crossed over the inside of the other.